Treating joint pain NSAIDs can lead to side effects, hospitalization and even death. Is there an alternative for your patients? 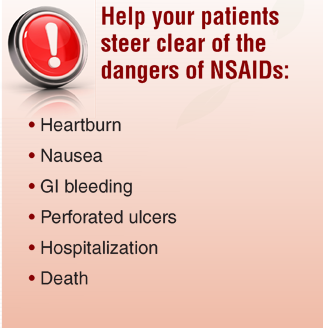 Conventional prescription and over-the-counter joint pain medications like acetaminophen, acetylsalicylic acid (ASA) and other non-steroidal anti-inflammatories (NSAIDs) can cause serious side effects that can lead to hospitalization and even death. 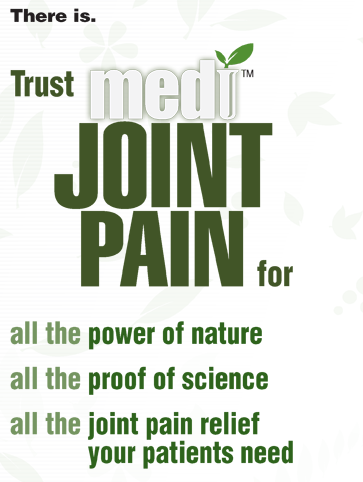 MediJoint Pain is 100% natural, Platinum Grade joint pain relief. That means it contains none of the ingredients found in NSAIDs - and so there are none of the associated side effects and risks.